Coming from a family of doctors and engineers, Jagjit (Rupy) Kaur was always interested in the healthcare field and ultimately decided on physiotherapy due to its challenging but life-changing nature. 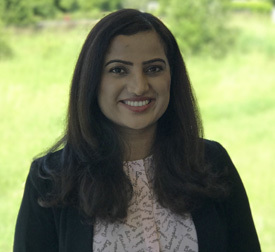 As a Physiotherapist at Langley Sports & Rehabilitation, Jagjit (Rupy) Kaur most enjoys being able to help patients recover from an injury and maintain wellness without side effects, improving their overall quality of life. When she isn’t helping patients in the practice, Jagjit (Rupy) Kaur enjoys relaxing and watching television and writing poetry. She also has a love for dance, participating in many school and college events as Captain of her local dance group. In 2010, she was named Miss Canada Panjuban. One of Rupy’s favorite quotes is “Once you start working on something, don’t be afraid of failure and don’t abandon it. People who work sincerely are the happiest,” which is something he attempts to convey to her patients during their treatments at Langley Sports & Rehabilitation. To schedule an appointment with Rupy and discover how she can help you, please contact our practice today to get started.